That’s where Planned Parenthood Advocates of Arizona (PPAA) comes into play. PPAA’s rigorous endorsement process selects candidates who we know we can rely on to uphold the principles of bodily autonomy and reproductive choice that are central to our values as an organization. But the endorsement process means more than that. 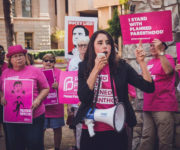 These are candidates who not only want Planned Parenthood’s logo next to their name — in pursuing an endorsement from Planned Parenthood Advocates of Arizona, they intentionally request accountability from our organization. To hold them accountable, we need to show them we are invested in doing so. We do this by creating a presence during the election season. Pink shirts at phone banking and canvassing events, people who support Planned Parenthood on the ground, side by side with their campaigns, to show the candidates, their staff, and the larger Arizona community that we are present, formidable, and capable of ensuring the protections of our rights and the policies we want to see passed. So, what does canvassing or phone banking do, especially in a so-called red state like Arizona? To put it in perspective, the last midterm election only had around a 25 percent turnout among eligible voters. 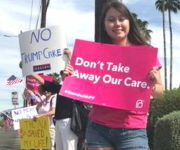 People in Arizona don’t want to feel distant or unable to engage with their political representatives, so engaging supporters and likely voters for reproductive health care and women’s rights could make all the difference between a non-voter and a voter. In the last midterm election, anti-choice candidates won by around 170,000 votes. The number of likely blue voters who didn’t turn out to vote was 193,000 — 20,000 greater than the margin by which Republican candidates won. There are two very viable, potential scenarios that can play out in November. In the first, things stay as they are. Brett Kavanaugh gets appointed to the Supreme Court. No one challenges that from the Senate on behalf of Arizona. Roe gets overturned. The governor signs an order that revitalizes the law banning abortion in Arizona. All the while new laws harming education, health care, workers, the poor, and women will continue to pop up and pass year after year. We’ll be there fighting every step of the way, but the prospects are frightening. The other future is brighter. We come together and help campaigns. We get out the vote. We work with candidates to make sure their potential supporters are turning out to the polls to vote for them. We have a new ally in the Senate, one who we can hold accountable. We have a new governor, one who wants to work with us to build a better future for Arizona women. And we have people in the Legislature to block harmful bills, to listen to their constituents, and to keep us in mind with their votes. If you have the opportunity to help make the second future a reality, the means to do so, and the drive to do it, wouldn’t you take that chance and spend a few hours in the evening making some phone calls? Wouldn’t you take an hour or two on the weekend to make sure potential voters are making it to the polls or putting their ballots in the mail? With reproductive choice on the line this November, we all have the ability to make tangible change that will go beyond the scope of an average vote. You, individually, can have a huge impact on the next electoral outcome. You can contact me if you’d like to support our get-out-the-vote efforts or volunteer for an endorsed candidate in your legislative district. Sign up here to become a member of the Planned Parenthood Action Fund. And if you’re not already registered to vote, be sure to register to vote online — the deadline to register to vote in November’s midterm election is October 9. This entry was posted in Activism and tagged abortion, activism, Arizona, Brett Kavanaugh, elections, reproductive rights, Roe v. Wade, volunteer opportunities, voter turnout, voting by Planned Parenthood Advocates of Arizona. Bookmark the permalink. Great article Mellie. I will be phone banking.